Reference number for this case: 7-Jan-54-Serqueux. Thank you for including this reference number in any correspondence with me regarding this case. 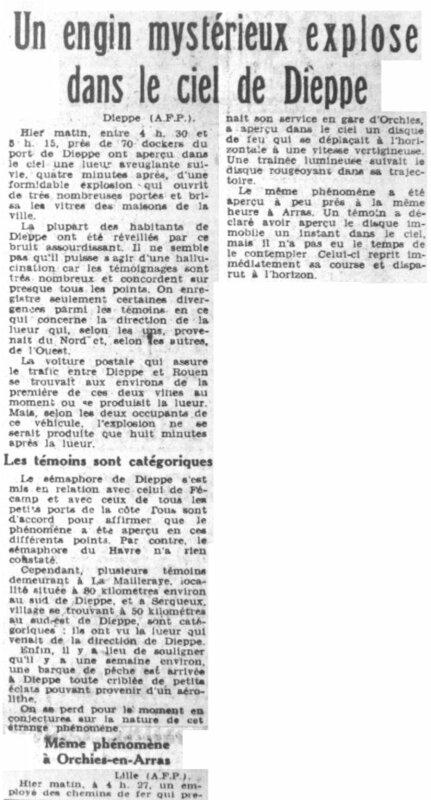 In the context of the explosion of a meteor perceived from Dieppe and the surroundings, on January 7, 2019, the newspaper Le Provençal for January 8, 1954, reported that people of Serqueux, a village located 50 kilometers southeast of Dieppe, categorically claimed to have seen the light coming from the direction of Dieppe. This quite commonplace event ended up without source, details or explanation, in a German ufology database on the Web in the 2000s. Yesterday morning, between 4:30 and 05:15 nearly 70 dockers of the Dieppe harbor saw in the sky a blinding gleam followed, four minutes later, of a formidable explosion which opened very many doors and broke the windows of the houses of the city. Most of the Dieppe residents were awaked by this deafening noise. It does not seem that it can be an hallucination for testimonys are very numerous and agree on almost all the points. Only certain divergences are recorded among the witnesses with regard to the direction of the gleam which, according to the ones, came from the North and according to the others, from the West. The mail van which ensures the traffic between Dieppe and Rouen was around the first of these two cities at the time when the gleam occurred. But, according to the two occupants of this vehicle, the explosion occurred only eight minutes after the gleam. The semaphore of Dieppe was put in relation to that of Fécamp and those of all the small habors of the seaside. All agree to state that the phenomenon was seen in these various points. On the other hand the semaphore of Le Havre did not notice anything. However, several witnesses from Mailleraye, localised approximately 80 kilometers approximately in the south-east of Dieppe, and at Serqueux, village at 50 kilometers in the south-east of Dieppe, are categorical: they saw the gleam which came from the direction of Dieppe. Lastly, it is necessary to stress that one week ago approximately, a small fishing boat arrived in Dieppe very sifted of small pieces which may come from an aerolite. One loses oneself for the moment in conjectures about the nature of this strange phenomenon. Yesterday morning, at 04:27, a railroad worker which took his service in the station of Orchies, saw in the sky a disc of fire which moved horizontally at a vertiginous speed. A luminous trail followed the reddish disc in its trajectory. The same phenomenon was seen about the same hour in Arras. A witness stated to have seen the disc motionless one moment in the sky, but he did not have the time to contemplate it. It began again its race immediately and disappeared at the horizon. This ufologist indicates that on January 7, 1954, the whole sky of the Seine-Inférieure department was lighted by a general fire. The light was so intense that during half a minute, the railways employees of Serqueux were able to read the serial numbers of the wagons. "Il is very likely that the phenomenon observed this morning in the Dieppe region was nothing else than a fireball." Aimé Michel states further on that it is the best explanation for most of the observations in that region that morning. The January 7, 1954, meteor. [lp1] Article in the regional newspaper Le Provençal, France, January 8, 1954. [am5] "Lueurs sur les Soucoupes Volantes", book by Aimé Michel, Mame publisher, France, page 7, 1954. 1.1 Patrick Gross January 31, 2019 Addition of the Summary.